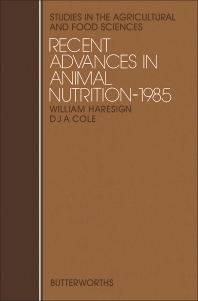 Recent Advances in Animal Nutrition — 1985 focuses on the different compositions of animal feeds. The book first discusses the prediction of energy value of compound seeds. Existing methods for the prediction of metabolizable energy (ME) or digestible energy (DE) from chemical composition; poultry and pig compound feeds; ruminant compound feeds; and technical and analytical variation in the chemical composition of compound feeds are described. The text also looks at the fiber content of animal feeds, the influence of fiber on digestibility of poultry feeds, and the role of dietary fiber in pig diets. The book highlights the effect of fiber in compound feeds on the performance of ruminants. Feed intake and rumen fermentation; digestibility and energetic feeding value; and milk production and composition are considered. The text also discusses the response of pregnant animals to protein and energy intake. The book also underscores developments on anticoccidial agents for poultry. The effect of coccidiosis on growth rate and feed conversion efficiency; development of resistance to anticoccidiosis products; and continual use of ionophore anticoccidial products are considered. The text also discusses eggshell formation and quality, seasonal variation of appetite in ruminants, and photoperiodic influences on milk production in dairy cows. The book is valuable for readers interested in studying the varying compositions of animal feeds.